For the first time ever, I saw an ad for a local restaurant on my Facebook feed, I took the bait and went there for lunch. I had driven by many times, but always said to myself, “What the heck is that?” Now I know. Bucket O’ Shrimp is perfectly imperfect and joyfully serves succulent seafood to those bold enough to give it a try. What’s the imperfection? Only that it’s in the wrong location, in my humble opinion. Bucket O’ Shrimp belongs halfway down an ocean pier in the Bahamas or somewhere along a romantic coast. The food is so good it doesn’t matter to local folks who seek it out for what it is: a tremendous place for absolutely mouth-watering food, served by delightful people. My point is she would NEVER have heard Bucket O’ Shrimp call to her. It takes a leap of faith (or hunger) to take a chance on a restaurant that looks like it’s part of a BP gas station. Don’t get me wrong. I loved it — after I decided to go there, but it is never going to win any awards for curb appeal or being located in the perfect place. Alas, it’s across from where the old Sam’s Club was on Frontage Drive in the no-man’s land that is half Gainesville, half Oakwood and half Flowery Branch. Even the Waffle House that was across the street went belly up, after Sam’s Club moved. 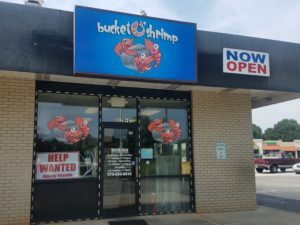 You’ll find Bucket O’ Shrimp at 3170 Frontage Road, on the far side of the strip mall with Aldi’s and El Sombrero, next to the ice cream place with a name that slips my mind at the moment. There’s nothing shabby about this eclectic restaurant. It’s not scary, like Waffle House at 3 AM. Maybe my problem was that the name reminded me of something out of SpongeBob SquarePants. I almost expected to see Patrick or Squidward inside. 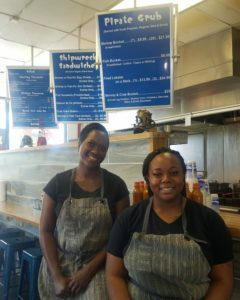 Instead, the ladies working at Bucket O’ Shrimp were beautiful inside and out. They were sweet, helpful, friendly and just as down to earth as your favorite neighbor. Caylor cooked my order as if she were serving up a masterpiece. And she was right. There were so many items I wanted to try. Their Shrimp or Fish Po’ Boy looked heavenly. The buckets of shrimp were hard to turn down. 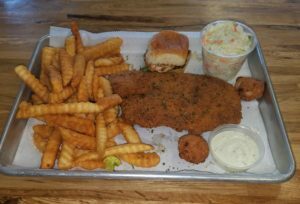 The Crab Cake Sliders finally called to me, so I added one to my order when I finally chose the Fish Bucket with talapia and the most wonderful french fries this side of Paris. I added cole slaw. A drink and a couple of hush puppies came with my order. The worst part of my meal? The french fries were perfectly cooked and perfectly spiced. I honestly didn’t want to eat them all, but I could not resist. By the time I was almost finished, I was licking my fingers to snag every last crumb from my plate. Please Note: As always, no one had any idea that I was going to Bucket O’ Shrimp to consider doing a review. I paid for my meal (total was $16) and didn’t get any special treatment. That way, I believe you can expect the same great service and food that I received. There’s not much room for dining inside, so most diners choose to pick up their food and take it home or to Lake Lanier for a picnic or dinner on the boat. 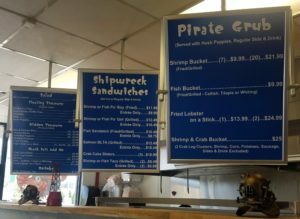 The next time you want to impress friends — without having to cook the food yourself — pick up a Shrimp, Crab and Lobster Bucket with enough seafood, corn, potatoes and sausage to feed every pirate or land-lubber you know. Bucket O’ Shrimp would be a dandy place to take a first date. If they say, “Oooh! That isn’t very appealing!” you know you’ve met someone who isn’t perfectly imperfect. Eat there anyway. You’ll enjoy your meal and there are always other enjoyable people there too.